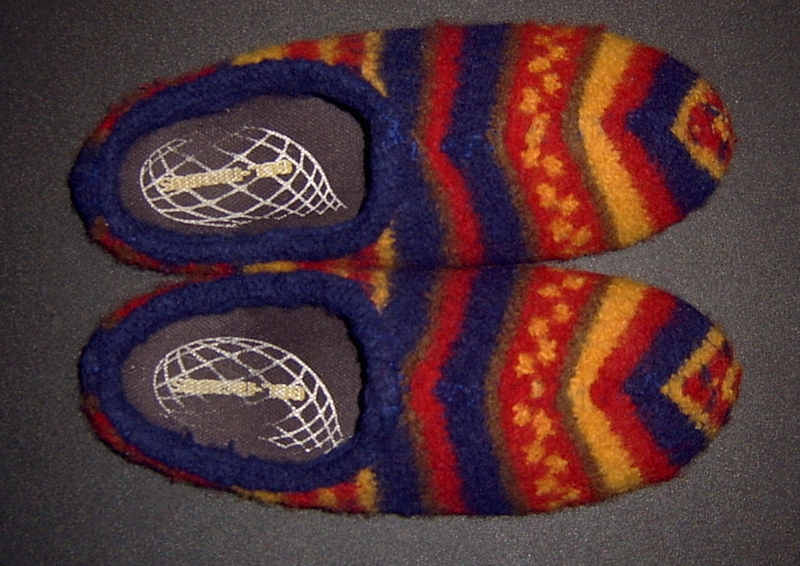 This project resulted from a request to turn an old, but hardly worn, woollen cardigan into slippers for a 40th birthday present. I did not start documenting it until I was part way into the project, so there are no photos of the original sweater. I welcome feedback on the project, and constructive comments about how the presentation might be improved. Acquire a 100% woollen sweater/cardigan or similar knitted garment preferably made from 10 ply or chunky yarn. The garment I used was 10 ply fair isle knitting, so quite thick, making it a particularly suitable starting point. I see no reason why cabled kitting wouldn’t work, but you would have to be careful where you placed any thick knobbly textures, specifically not under the foot. I think non-knitted 100% wool fabric of sufficient thickness would also be suitable, as we finish up with thick felt, and ability to stretch is not required. 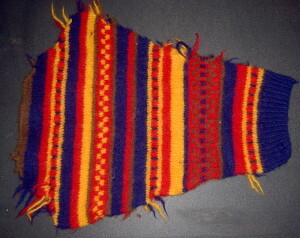 The larger the original garment, the more flexibility there will be for deciding what knitted designs to include/exclude. The cardigan I used had been knitted for a large man, and I was able to get a slipper out of each sleeve, which made pattern matching easy, and left the rest of the garment for other projects. You will also need a pair of flat shoes (trainers are great – even better if they come with insoles). I found the shaped, support-type of insoles were excellent, because when they were slipped into the finished slippers they gave the slippers an improved degree of firmness and shape which made it easier to take them on and off. A piece of old sheeting or similar cloth, from which to make a pattern. Paper might also work, but cloth is easier to fold around the foot. A soft pencil, felt pen or other method of marking the pattern cloth. 100% wool yarn of an appropriate colour (to match the sweater). I used a double strand of 4 ply knitting yarn. A washing machine preferably with a hot wash and cold rinse cycle. Spin-drying is an added bonus. Hand soap, lux flakes, or whatever you like to felt with. I like a dispensing bottle of liquid soap, as it makes it easy to squirt out small amounts as needed. Pair of sharp strong scissors to cut the felted knitting, and something to unpick the garment seams at the start. Large strong sewing needle that can be used with your choice of yarn for sewing up. It helps if it has a sharp point to puncture the felt easily. A general purpose felting needle. I used a peach WIZPICK needle. If you want soles, a piece of thick flat felt large enough to cut out two soles, or merino sliver or batt (150 – 200 g should be sufficient) to make a piece of thick flat felt from. Time! Though it doesn’t have to be done in one episode. I probably spent the best part of two days total, but 4 hrs of this was sewing the soles on while I “watched” TV, and some of it was spent taking photos. Unpick the garment seams to create individual pieces of flat knitted fabric. Set the washing machine to a hot wash/cold rinse cycle. I use a low volume/small wash choice as it gives greater force to the agitation and felts faster. Add whatever soap you are using for felting, and allow machine to fill with water. Place the pieces of fabric in the washing machine, and continue with the wash cycle. I do not put the knitted fabric before the water, because of the added felting action of having the hot water falling on only some parts of the fabric. I am aiming for consistent felting and shrinkage. Stop machine and check for felting progress every few minutes. 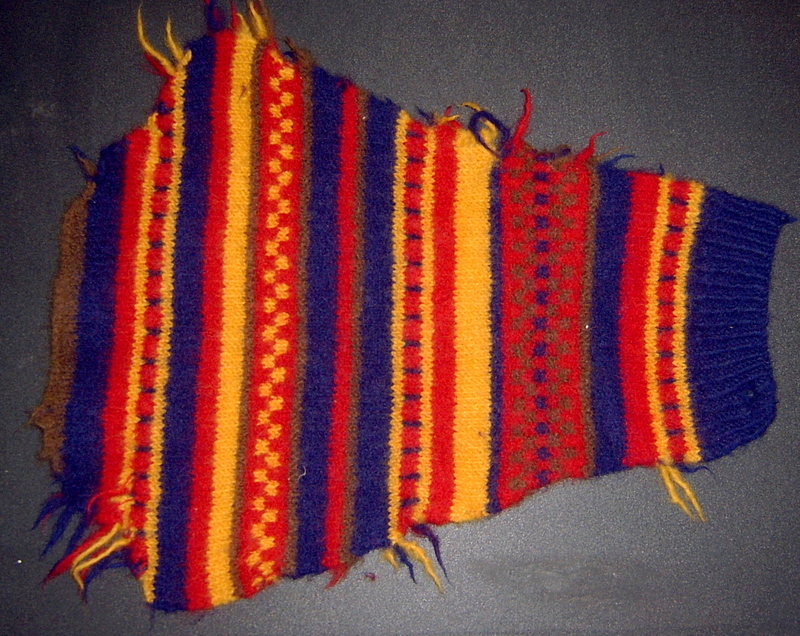 You are aiming for a firm felt (which may still has a small amount of stretch), where most of the shrinkage has already occurred, although knitting stitches are still visible. I kept resetting the cycle so the machine did not get rid of the hot soapy water. The machine agitated for about 15 – 20 minutes total, but the amount of agitation needed is likely to vary widely, so check frequently. When you are happy with the degree of felting, continue the cycle to rinse out the soap and spin-dry the felt. I don’t have a foolproof technique for this. I can only tell you what I did. The good news is that small mistakes can be accommodated during the hand felting process. If in doubt error on the side of a little too big, because you can always felt a bit more to shrink in size. Put your flat-soled shoe in the middle of the cloth you are using to make the pattern. Draw the cloth up in both sides of the front part of the foot to meet in a line running down the middle of the foot. 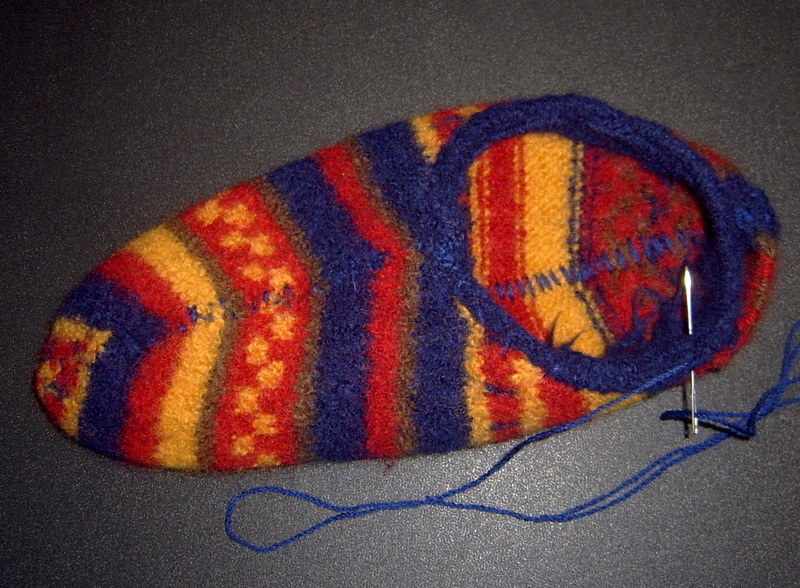 Pin a seam along this central line from the top of the arch, over the toe and back along the centre sole of the foot to approximately the base of the toes. Pin another seam up the back of the heal, and along the underside of the heal. Taper both pinned seams off to nothing (like a dressmaking dart) on the sole so there is no bunching of the cloth. Draw a line from the top of the arch to the back seam on both sides of the ankle that reflects the shape you want for the opening of the slipper. 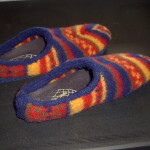 My slippers were low cut (Croc – style) as requested by the customer, but you could make them higher like a normal shoe, or anywhere in between depending on what you wanted in the finished slipper, and also to fit the pieces of felted fabric you have to work with. While the cloth is still pinned around the shoe, draw a line on the cloth on both sides of the seam (on the left and right of the seams). 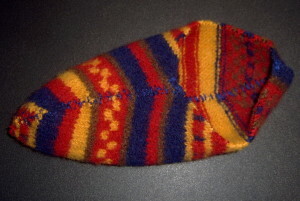 Do not leave a seam allowance, because the slipper seam will abut the felt edges, not overlap them. Take out the pins and remove the cloth from the shoe. Smooth any lines if necessary, and cut out the cloth pattern. Mark one side of the pattern cloth “top”. 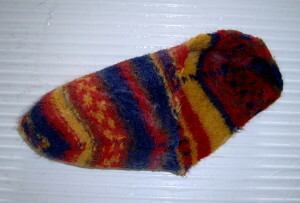 Lay out the felted sweater pieces of fabric (use an iron to press flat if necessary). Keep any felted yarn ends for needle felting in step 9. Lay the pattern cloth on top with “Top” facing up. Now you need to find another piece or area of felted fabric upon which you can lay the cloth pattern upside down. If there are stripes or other defining patterns in the felted fabric, make sure the patterns meet up along the seams in an acceptable way. 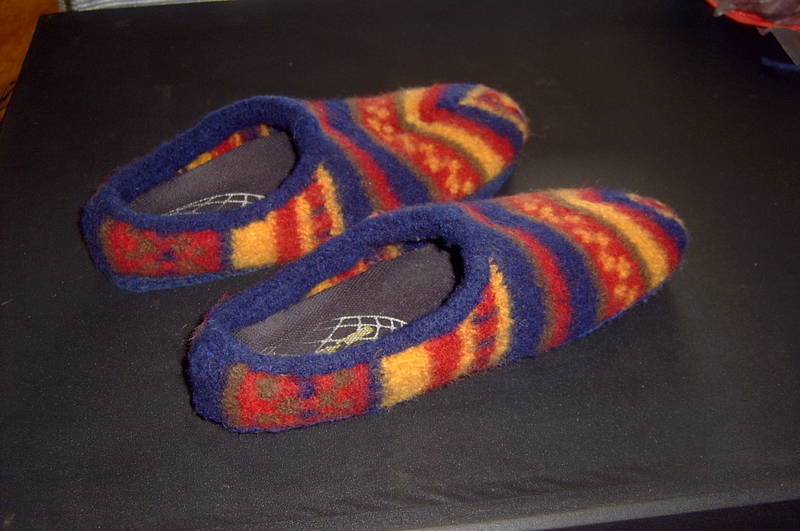 Also, make sure that the stripes/pattern are in the same position on both slippers, so they look like a pair when finished. If your pattern cloth will fit onto sleeves it is fairly simple to match stripes etc, for consistency. If not you may be able to make two sides of a cardigan work, but check how any pattern will meet on the font seam in particular. You may find that the front and back of a sweater match well. If none of these options work, you may have to accept unmatched patterns in your slippers. Pin the pattern cloth to the felted fabric and carefully cut around it. Flip the cloth over before pinning and cutting out the second slipper. You will end up with two pieces of felted fabric, each looking like this. Each piece makes one slipper. 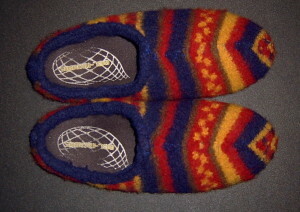 To make the toe of the slipper more rounded, round the points (on left in photo) a little more. The point can also be reduced by hand felting in step 7 and needle felting in step 9. Using a strong 100% wool yarn of an appropriate colour, and the sewing needle, stitch the front and back seams. Abut the felt edges and stitch over and over, taking the stiches about ¼ inch (6 mm) into the felt fabric on each side of the seam. Don’t worry about the stitches showing at this point (that can be fixed later). The aim is to get a strong and firm join between the two abutting edges. Working on one slipper at a time, immerse it in warm water until it is completely saturated. Add a little soap and begin felting. This should be a vigorous process. Put your hand into the slipper and rub on a smooth but uneven surface, such as a dish rack draining tray, old-fashioned washboard or coarse bubble wrap. Of course, if you have a felting board it would be ideal! This process should result in a little more shrinkage that will accommodate the fullness caused by making the pattern go around the outside of the shoe, but check for size reduction beyond this, and stop if the slippers will become too small. Remember to test size according to how you want to wear the slippers – with or without socks or stockings. If you have insoles, you can shrink the slippers to fit the insoles. Whatever you do, make sure you shrink both slippers by the same amount! If you are concerned about the strength of the seam, use a little merino sliver and felt it across the seam on the inside of the slipper. 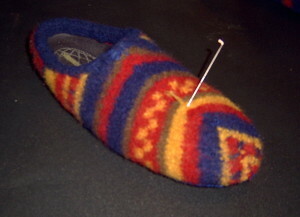 Use a felting needle if there is difficulty in making it stick to the slipper felt. I did not think this was necessary, so did not do it in the slippers I made. A firm band around the opening will help the slipper keep its shape, make it easier to take on and off, as well as being easier to walk in. For my slippers I was able to use the band that went around the front opening of the cardigan, and which was felted along with the other pieces of knitting. 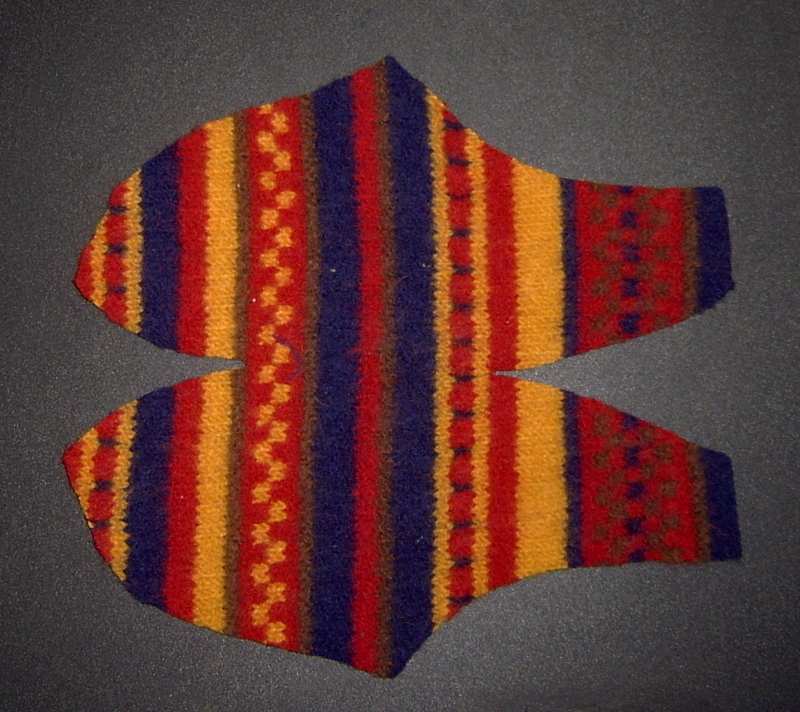 Alternatively you may be able to use welts cut off the bottom of sleeves or body of the sweater, or other strips of felted knitting cut from the felted sweater pieces. Make the band slightly shorter than the finished opening size, to ensure the slipper fits snugly and to accommodate any stretch due to wear. Pin the band over the felt edge of the opening, and ease the felt edge into the length of the band. Pin, then stitch in place using the wool yarn. Hand felt the band to a hard felt to ensure it is firmly attached and that it isn’t going to stretch out of shape. Cut small lengths of the appropriate colour of felted yarn from the felted knit fabric and needle felt over the seam junction and stitches to hide the join. Additional needle felting in a sideways direction will also help blur the seam line and fill any small gaps where the edges have not felted together properly. A separate sole can be added to give more padding and better insulation from cold floors. It could also be replaced when it wears through, thus extending the life of the slippers. I used 7 layers of merino to make a thick solid piece of flat felt large enough to cut two soles out of. 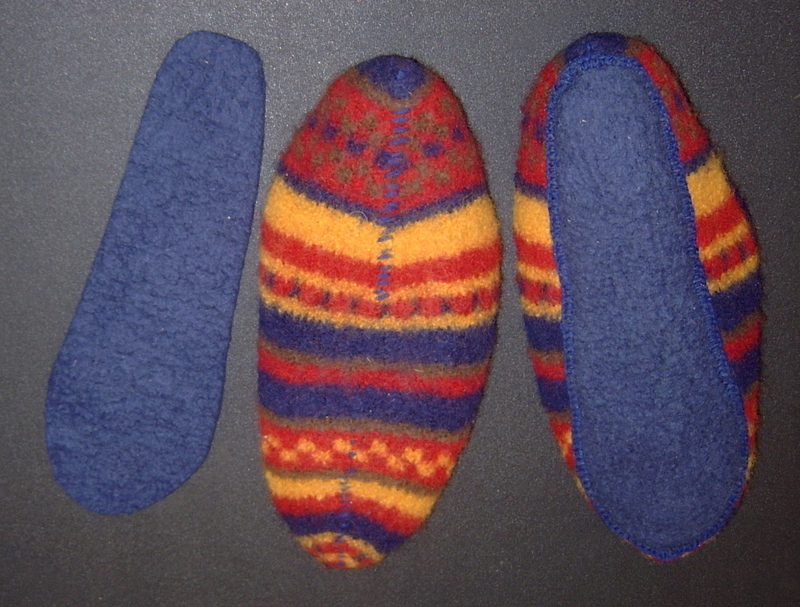 You could also consider making felt insoles if you don’t have commercial insoles. Use the insole as a pattern or make a pattern up to fit the slipper. Pin the pattern onto the sole felt and cut out. Remember to flip the pattern over before cutting out the second sole. Pin the sole to the slipper, making sure that you put the right sole on the right slipper and left sole on the left slipper, if in fact you can still see a difference between the shape of the left and right slipper! (I couldn’t). 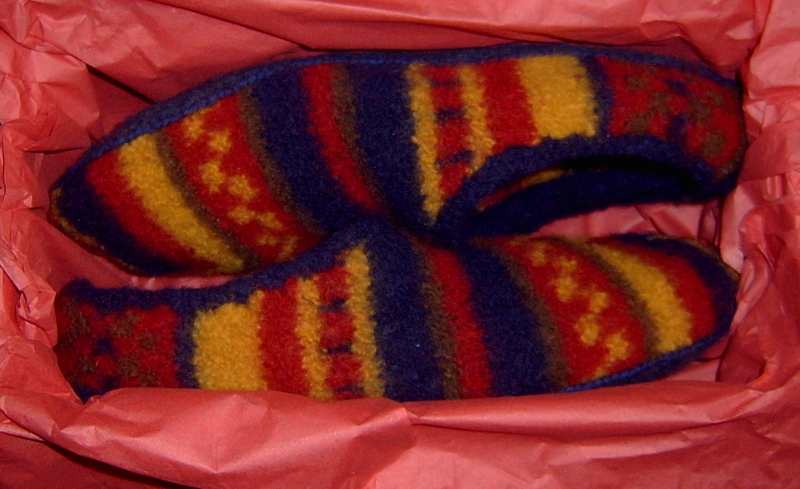 Use the needle and wool yarn to stitch the sole firmly to the bottom of each slipper. I used a closely-spaced blanket stitch. 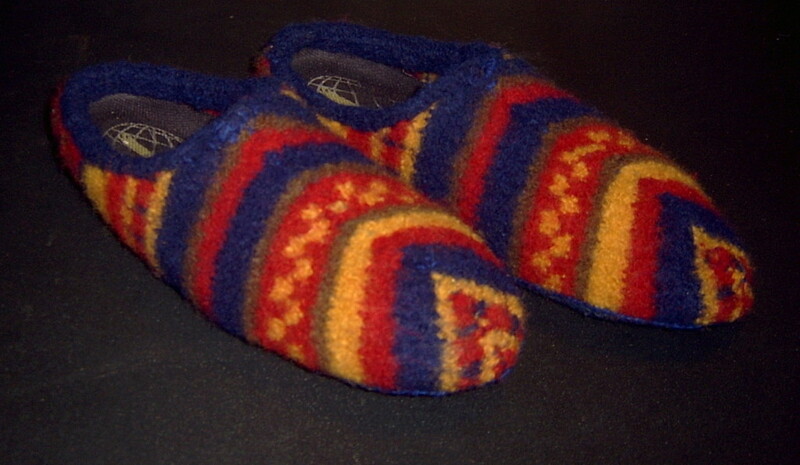 Attach bows, buttons or any other embellishments you’d like to add to finish making the slippers. Your slippers are now ready to wear. If they are intended as a gift, try finding a shoebox of the appropriate size, line with tissue paper and pop the slippers into their nest for a real unwrapping surprise. You could even decorate the box for that special person.